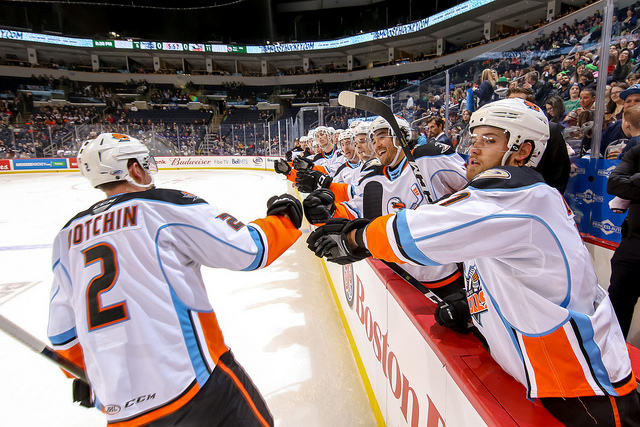 Defenseman Jake Dotchin returned to action with the first two-goal game of his five-season professional career helping lead the San Diego Gulls to a 4-1 victory over the Manitoba Moose on Sunday in Winnipeg, Manitoba. Goaltender Kevin Boyle stopped 38 of 39 shots and the Gulls (32-20-3- 3) killed all three of Manitoba’s power-play opportunities to remain tied with the San Jose Barracuda in the race for second place in the American Hockey League‘s Pacific Division and home ice advantage in the first-round of the Calder Cup Playoffs. San Jose (32-19-2-4) was a 9-0 winner over Colorado on Sunday. The Gulls have 10 games remaining, one more than the Barracuda. Dotchin opened the scoring 14 minutes, three seconds into the first period by putting a shot from the point past Moose goaltender Eric Comrie for his third goal in his 12 games with the Gulls this season. Dotchin concluded the scoring with a short-handed empty-net goal with 2:30 left in the third period. The Gulls increased their lead to 2-0 38 seconds after Dotchin’s first goal as Ben Thompson put a snap shot from between the faceoff circles over Comrie’s glove for his fourth goal in 48 games with the Gulls this season. Kiefer Sherwood was credited with the Gulls third goal as his pass intended for Sam Carrick went off the skate of a Manitoba defenseman and into the net with 1:20 left in the first period. Following a scoreless second period, former Gull Ryan White put a shot over Boyle’s glove with 13:36 to play for his second goal in 17 games with the Moose, the Winnipeg Jets AHL affiliate. The Gulls were outshot, 39-37, including 18-13 in the third period, before a crowd at Bell MTS Place announced at 6,211. The three successful penalty kills increased the Gulls streak to 27, the longest in their four seasons in the AHL. “The commitment our guys have had, it’s been a run of 10-15 games our penalty kill has been stellar,” Gulls assistant coach Brett Ferguson said. The victory improved Boyle’s record to 21-9-1-0, extending his team record for victories in a season and the personal high in his three-season professional career. The previous high was 19 in the 2017-18 season. The Gulls were scoreless on their three power-play opportunities. Comrie (22-16-2-2) made 33 saves for Manitoba (30-27-4-2). He is a nephew of Fred Comrie, who owned the International Hockey League version of the Gulls in 1995 when he moved them to Los Angeles. Dotchin had missed the past 17 games because of an upper-body injury. He had not played since scoring a goal in a 4-1 victory over the Ontario Reign Jan. 21. Dotchin was recalled by the Gulls NHL parent team, the Anaheim Ducks, on Jan. 24, but did not play for them before being reassigned to the Gulls on Jan. 31. Dotchin has scored a goal in each of his past three games with the Gulls. The victory was the Gulls first in Canada in three tries. They were 0- 1-1-0 against the Moose in Winnipeg on Oct. 28-29. The two teams will meet again Tuesday in Winnipeg. The Gulls next game at Pechanga Arena San Diego will be Saturday against Ontario, the Los Angeles Kings’ AHL affiliate.